the corrymeela diaries: Is anyone keeping count of how many people I’ve lived with this summer? Is anyone keeping count of how many people I’ve lived with this summer? I am up to 101 so far. That is, people that have lived in the volunteer house, Coventry, since I arrived on June 27. Given that about 30, give or take, can occupy the house at one time, that’s a lot of coming and going in three months. That number covers everyone who was there before me (only one now ...) to those who were here for only a few days. I am the next to leave. 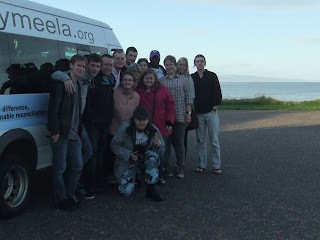 When people ask me, as they are starting to do, “What have you learned here at Corrymeela?” or “What have been your most memorable experiences?”, my response is without a doubt something about the people with whom I have been in relationship over the past three months – the other volunteers. The long term, mid term, short term, and summer volunteers. I have met people from just down the road in Ballycastle, from many different parts of Ireland and the UK, from all over Europe, and from Africa, the Philippines, the United States, and Canada. Below are my newest friends and roommates – the new long term volunteer team. They are (from left to right, front row: Matt (new program assistant from the U.S.), Michael (Germany), Stevie (NI), Lindsay (England), Emily (U.S.), Nathan (kneeling, NI), 2nd row: Desi (NI), Aaron (NI), Kelsey (U.S.), me (in front of Kelsey), Tytti (Finland), Anna (Sweden) and Fergal (NI). The photo was taken yesterday on our way home from a day trip to the Belfast Corrymeela office. Learning to live with 30 people at any time is no small task. Add on the pressures of sometimes up to 100 other folks at the centre for programs, and it’s a small miracle, and a testament to Corrymeela, that things run as well as they do. And then, most importantly – this is the spiritual practice piece - to let it go. I’m not saying it always worked, but it helped many times. And I’m certainly not saying that I didn’t have the occasional grumble to some of my fellow early risers, but I found myself learning to live with the constantly changing state of the kitchen – clean, unclean, clean, unclean ... and above all, to be surprised, delighted, and filled with heartfelt gratitude for the clean times. Which these days, is quite often, as it seems that the new ltv team seems particularly conscientious about cleaning up each evening. There are some things best avoided when living with 30 people – like trying to do laundry on the LTVs day off ... of course I forgot that rule today, so ended up in a long lineup for the two washers and dryers. Sure I was frustrated at first ... but in the big picture, it didn’t seem like a particularly important world event to get worked up over. And, there was a lot of laughter and negotiation involved which I might have missed had I not jumped in. When I think about those 101 people, and all the conversations I’ve had over the past three months, over a cup of coffee, tea, a meal, a glass of wine, or a beer ... I am in awe. Some of these people I know I will never see again. But I carry those conversations, those encounters, deep inside me. I am changed forever because of them. Each relationship, however brief, has made an imprint on me, and I will never be the same. For that, I thank God every day for guiding me to this place. Speaking of relationships – today is Pat and my 33rd wedding anniversary. We sent each other the same e-card from Jib Jab ... it was, as he said, an “O Henry moment.” We’ll celebrate next week, but today I went to lunch at O’Connor’s with Jo and had a beer and fish and chips. When she heard it was my anniversary, she insisted on paying. Thanks Jo, and Happy Anniversary Pat.